In 1997 a most expected remake hit the market with a great bonus. Actually, 2. Later re-used to form the new Star Wars Saga Deluxe Vehicle Endor AT-AT Walker w/ Biker Scout and AT-AT Pilot this 1997 version was more based on the Empire Strikes Back movie. 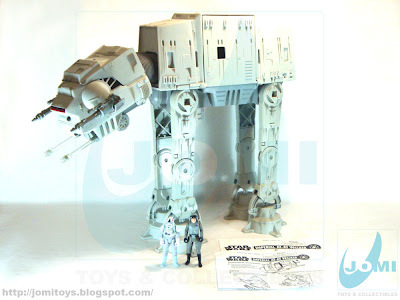 Including AT AT Commander and AT AT Driver figures (one of my personal favorites) this stands as one of the biggest toys and most cherished vehicles for Star Wars collectors. And considering it uses the vintage hull, it´s quite a deed. 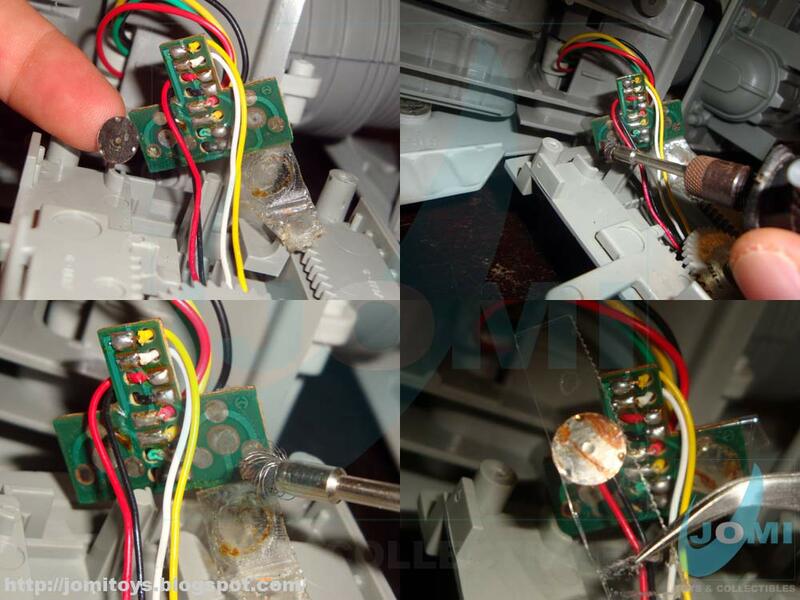 A common problem in these Hasbro/Kenner Electronic AT ATs was the printed circuit board controlling the front laser cannons and their peculiar sound. This is a great feature, so you really don´t want to miss that. And believe me, sooner or later, your AT AT will start to fade out even if you never open in for 20 years. Problem is... rust. Metal/iron oxidation. The way the cannons activate is shown above. In the actual same image where you can see where to focus your attention. When the cannon is pulled back, it clicks a metal shield which connecting 3 points in the printed circuit, activate the sound and light. When one catches rust, it won´t work. And it may get to a point where it may never work again in case you don´t live in an absolutely dry environment. This AT AT walker in particular, was a very expected item. And an unfortunate episode at the same time. My favorite Imperial machine and for a LONG time I awaited the announced release of a POTF2 version. Ended up going to Spain to get one and although with the original US$80 price (or the equivalent in pesetas back in 1998) spent seem a small amount for such a wanted prize. It would take me longer than a year to have the guts to open it. Only to find out this was already been open previously. 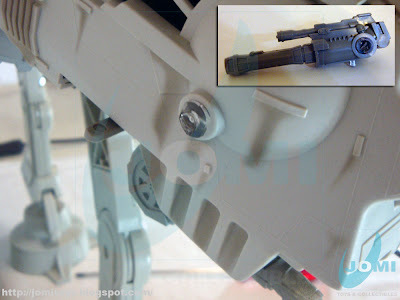 The stickers were applied, the chin gun stopped working in a couple of months (but like explained above, it was fixed) but the saddest detail was a broken right cannon (pictured above). You can only imagine the frustration. And since I was now in Portugal and the AT AT was completely sold out, there was nothing to do. But to embrace this vehicle in my collection and try to figure out what to do. A lot of solutions were possible but never used. 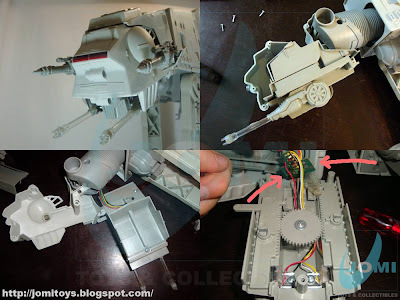 Well, the years have gone by, and when our team gathered to decide what to do about Star Wars , and the decision to trade them away was made, we all thought it was better to leave the decision about what t do with that cannon to the future owner... (cleaning a tear). MIB. Opened for assembly and photo shoot. Right cannon connection broken. I do remember these being sold for 8.000$ (40€) on Toys r Us in Porto somewhere during the 90's (it was some kind of clearance sale), but since I wasn't collecting toys back then, I miss the opportunity to get this toy at a bargain price and for so many years this was my most regretful moment in my toy collecting history. 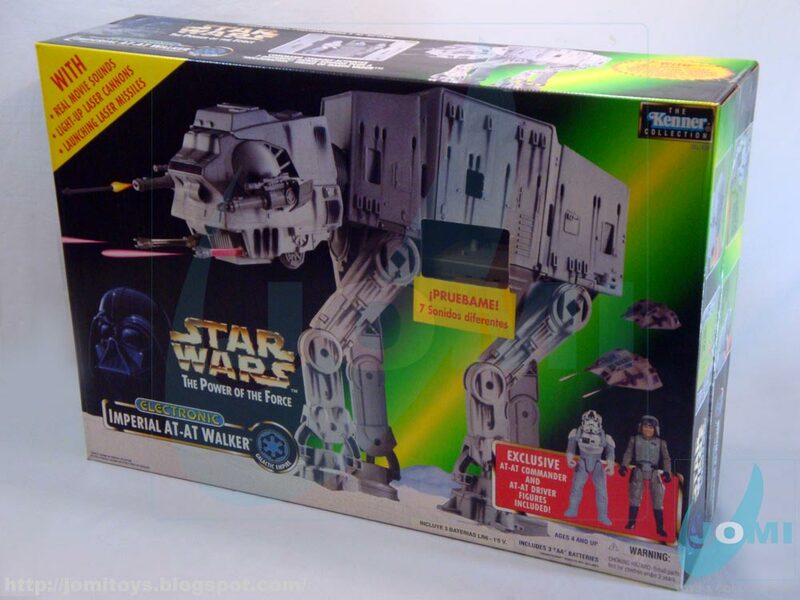 When I started collecting Star Wars toys (around 1999), the AT AT was no longer available in stores, and was too big to order from overseas, so I had to wait until the Star Wars Saga version to get one of these babies. Still, and although not one of my priorities right now, I do plan to get this version someday to display along my other AT AT.